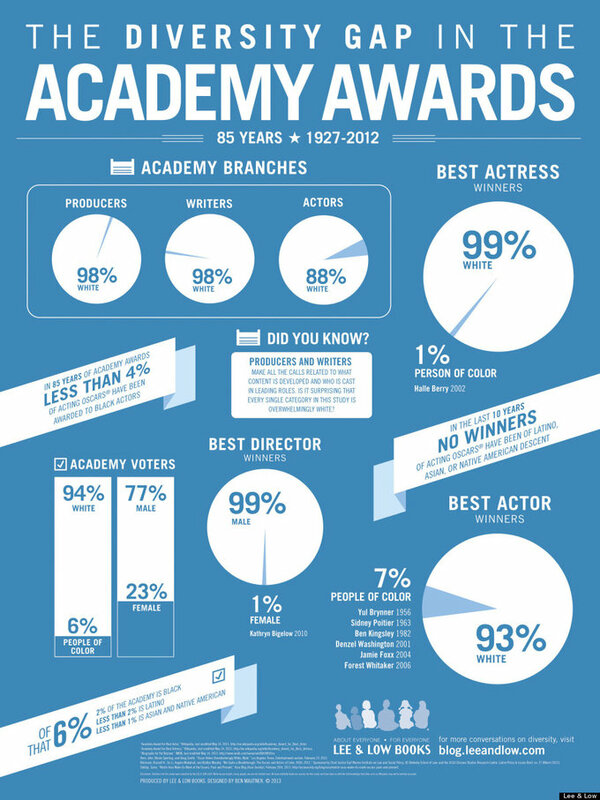 We’ve all seen the statistics about the diversity gap at the Oscars before, but they are still shocking and worth repeating. Amazingly, since the Academy Awards began 85 years ago, only one woman of color has ever won the Academy Award for Best Actress (Halle Berry) and only one woman has ever won the Academy Award for Best Director (Kathryn Bigelow). Men of color haven’t fared much better with only six of them having ever won the Academy Award for Best Actor and none winning the Academy Award for Best Director. A recent post over at Lee & Low Books addressed the issue with an infographic (below) as well as interviews with independent filmmakers about the state of diversity in film. leads, Hollywood will be more open to taking chances.” See the original post here. Meanwhile, Newsweek.com delves further into Oscar’s “woman problem” and concludes that “Films with meaty roles for women are, by and large, considered lower caliber by the Academy.” Could Oscar break that curse this year with “Gravity” featuring Sandra Bullock?